Brewing Process & Ingredients | Harwich Town Brewing Co.
At the heart of every good beer lies barley. The grains used impart colour and the sweet flavours in beer. Some of the finest brewing barley in the world is grown on our doorstep in East Anglia. The barley is harvested and then goes through a process which has changed little over the centuries. The grain is steeped in water and encouraged to germinate. This makes starches available as food for the growing plant. Then germination is halted by kilning – that is heating of the grain to dry it out and to impart colour. The higher the heat, the darker the grain becomes. East Anglia has some of the world's best conditions for growing malting barley. This is the most widely used malt and may account for up to 100% of the grain in your beer. This would be a very pale beer. Kilned longer this malt is the second most widely used in English bitters and imparts the copper/red colour and a nutty biscuit taste. This is unmalted barley, which is kilned at very high temperature, and so looks almost burnt. 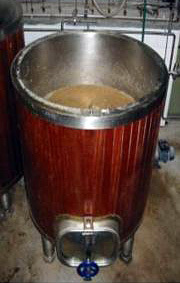 It imparts colour and bite to Porters and Stouts. No more than 10% of the grain in you beer would be Roast Barley. There are many other types of barley used in the brewing process and all add something to the taste, look and feel of the finished product. The skill of the brewer is to use the grains in the correct ratios to present to you the best beer he can make. If the grains give sweetness to the beer, then hops add bitterness and aroma. Thought to have been brought to England by Flemish weavers in the 15th Century, hops also help to prolong the life of beer as during the brewing process, oils are extracted from hops which remain in the beer. Hops are classified as to whether they are used for bittering, aroma or both. Fuggles and Goldings, two hops synonymous with UK brewing are now considered to be aroma hops due to their low concentrations of Alpha Acids of between 3% to 7%. 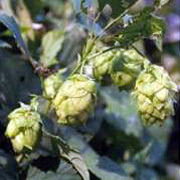 Newer varieties of hop can contain up to 17% Alpha Acid, and these are now used as bittering hops added early in the boil to extract the maximum amounts of bitterness. Aroma hops are generally added for the last 15 minutes or less of the boil, where they add very little bitterness to the beer, but provide the aroma you smell when you first lift the glass to your lips. As stated, beer is brewed using grain and hops, but the alcohol is made by yeast working on the sugars which are obtained from the grain. This process is called mashing and is probably the most important process in beer making. The cracked grain is mixed with water at 73°C until a porridge-like consistency is obtained with a temperature of between 65-68°C, The mash is then left to stand for 60 minutes, during which time the starches within the grain are converted to sugars. If the brewer is looking for a sweet beer, he may raise the mash temperature whereas a lower mash temperature will lead to a drier thinner beer. The resulting liquid is now call wort. The wort is then pumped to the copper and hot water 74-76°C is then sprayed over the top of the grain bed to wash out any residual sugars. The aim is to collect as much sugar as possible from the grains. 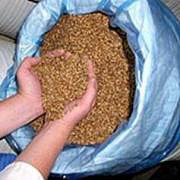 The spent grains are then bagged up and used on a local dairy farm as cattle feed. Once the wort is in the copper we begin the boil, we start the boil while we are still sparging and once sparging has stopped and the wort is boiling, we add the bittering hops. These boil for one hour. A second batch of hops is added in the last 15 minutes and these impart aroma to the beer. At the end of the boil, the wort is allowed to rest for 10 minutes to allow solid particles to settle out. The wort is pumped out of the kettle and rapidly chilled using a heat exchanger. When it reaches 18°C, the yeast is “pitched” into the wort. It is now classed as beer. Over the next few days in temperature controlled conditions, the yeast converts much of the sugar to alcohol. The beer is chilled to halt fermentation before all of the sugar has been converted to alcohol, this allows for secondary fermentation in either cask or bottle to give the beer some sparkle and life once the beer has warmed up again. 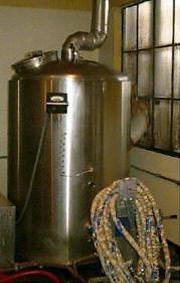 The beer may undergo a maturation or conditioning period of a week prior to being consumed.